In a recent study published in the journal Environmental Toxicology and Chemistry, scientists investigated the effects of popular agricultural insecticides – neonicotinoids – on wood frogs. Neonicotinoids are highly water soluble and can be easily carried via storm water to end up in streams and lakes. While the effect of these insecticides on growth and reproduction of wood frogs has been shown to be minor "environmentally relevant" concentrations – concentrations typically found in the natural environment – other types of effects have not been extensively studied. Stacey Robinson and her co-author Stacey Lee-Jenkins evaluated the anti-predator behavior of wood frogs after exposure to neonicotinoids. Physical changes are most commonly studied, but behavioral changes can also affect the health of wood frog populations. Wood frogs employ a number of strategies and behaviors to avoid being eaten: camouflage, immobility, crouching or assuming an "anti-predator" posture, but being able to flee quickly once detected is also critical to survival. Using juvenile wood frogs that had been exposed to the insecticide as tadpoles, the researchers evaluated how likely the frogs were to respond to simulated predator attacks, as well as how fast they moved, the distance they traveled and the total number of jumps they took to escape. The study found that when presented with a "predator," the frogs exposed to elevated levels of the insecticide as tadpoles jumped or moved less than those who had never been exposed. The good news is that both groups of frogs exhibited similar locomotive physical abilities in terms of distance jumped, number of jumps and the ability to find refuge. 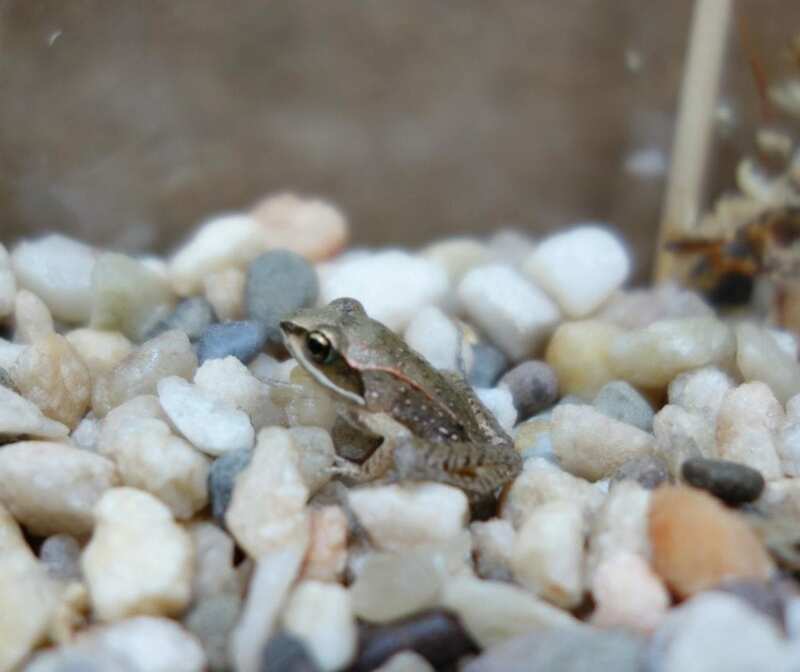 Robinson notes, "Behavior studies on juvenile frogs are rare; our study provides preliminary information or baseline characteristics on putative escape behavior of juvenile frogs to a mock heron attack. More work is required to develop standardized behavioral methods that have biological and population-level importance, particularly for sensitive amphibian life-stages." Traditional ecotoxicology studies focus on the physical effects a chemical has on growth and reproduction, but this study highlights the need to evaluate behavior when assessing the effects of contaminants on wildlife populations.